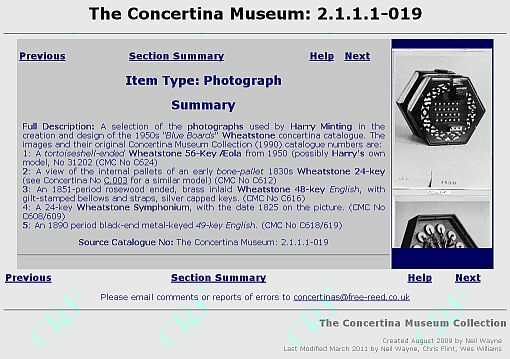 The image above shows a typical catalogue page for non-concertina items. At the top is the catalogue number for the item. Below, at the top of the darker grey area, is a navigation area allowing you to go to the previous or next item in the catalogue, or to the summary of the section of the catalogue you are viewing. The Help link takes you to this page. Alternatively, you can use the keyboard to navigate. The left-arrow, the P key or B key (remember Previous or Back) will take you to the previous item. The right-arrow, the N key or F key (remember Next or Forward) will take you to the next item. The up-arrow key, or the S or U key (remember Summary or Up) will take you to the summary of the section of the catalogue you are viewing. Below this a description of the item. To the right is a scrolling image area. This shows thumbnails of all the images associated with the catalogued item, but you will need to hover your mouse pointer over the top or bottom of this area to scroll through the images. To view any image full size, left mouse-click on it. The navigation area is repeated below to allow you to navigate when reaching the end of a catalogue page, without having to scroll back to the top of the page on long pages. Catalogue pages for concertinas are very similar. Below the "Item Type" is a set of links allowing you to view descriptions and related images of particular parts of the instrument, such as the reed pans or bellows. This page created Wednesday 26 October 2011.